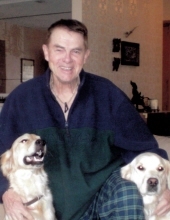 Larry L. Betsinger, age 81, was born in Des Moines, Iowa on March 22, 1937 to Leo and Madeline (Dolan) Betsinger and passed away on February 5, 2019 at home. He is survived by his sons; Troy and Gregory (Debbie), his brother Dan (Darilyn), sister-in-law Susan, 5 grandchildren and one great granddaughter. He was preceded in death by his parents, his wife, Constance (Conaway) Betsinger, and his brother Bob. Larry graduated from Dowling High School, served in the Naval Reserves and then worked in the private sector as a banker and businessman. He married Constance Conaway on May 5,1956. They were married 48 years at the time of her death. He was a world traveler and an avid collector of Olympic Pins. He loved bowling, golfing and his dogs Birdie and Bogie. Online condolences can be expressed at www.caldwellparrish.com. To send flowers or a remembrance gift to the family of Larry Betsinger, please visit our Tribute Store. "Email Address" would like to share the life celebration of Larry Betsinger. Click on the "link" to go to share a favorite memory or leave a condolence message for the family.